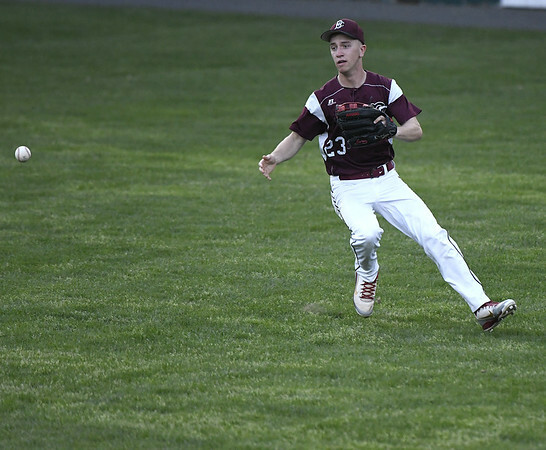 WEST HARTFORD - In a pitcher’s duel on Thursday, the Bristol Central baseball team came up short, falling 1-0 to Hall on a walk-off single off the bat of Daniel Hussey. Sean Wininger pitched well in the loss, firing seven strikeouts and allowing just two hits in six innings. The Rams (2-1) racked up six hits, including two by Jaylen Dias, and put runners on base in nearly every inning. Gavin Greger pitched the seventh. He hit a batter, who was then bunted over to second, and a wild pitch preceded Hussey’s walk-off hit. Sacred Heart 3, St. Paul 1: The Hearts (2-3) plated three unearned runs off Walker Sharp in the first inning, and that’s all the offense starter Hector Alejandro needed. He allowed just one run on three hits while firing 10 strikeouts and allowing two walks in 6 1/3 innings. Zach LaFerriere recorded the final two outs for the save. Sharp took the loss, allowing the three unearned runs on six hits, and he twirled seven strikeouts against three walks in five innings. Julian Thayer threw two strikeouts in one inning of work for the Falcons (3-1). Ryan Parent finished 2-for-3, and Sean Crean smacked a double in the second inning for the game’s lone extra-base hit. Bristol Eastern 2, Northwest Catholic 1: In a thriller that came down to the wire, the Lancers (3-0) stayed perfect by shutting down a late Lions (0-4) rally. Starter Ethan Ryan (6 1/3 innings, five hits, three walks, six strikeouts) twirled a gem to earn the win, and Dylan Woodsome picked up the save. Ryan worked out of a bases-loaded, no-out jam in the third by inducing a short fly ball out and cleaning up with two straight strikeouts. The game was scoreless until the top of the fifth, when Bristol Eastern’s Ian Latko scored on an RBI single by Carson Sassu. The Lancers tallied an unearned insurance run in the top of the seventh. Ryan got the first out of the seventh before allowing back-to-back singles that put him at the pitch-count limit. Woodsome fired a strikeout then gave up a run-scoring single to Evan Clark, but he bounced back with a game-ending strikeout. Northwest Catholic 4, Bristol Central 1: Despite getting a solo shot from Gwen Toreso in the first inning and eight strikeouts thrown by Peyton Greger, the Rams (2-2) did not have enough against Northwest Catholic (1-3). The Lions plated three runs in the top of the sixth to help erase four errors on the night, and Sam Scott (1-3) earned the win over Greger (2-2). Newington 5, Bristol Eastern 2: Despite picking up a win from its No. 1 singles player Kelly Simpson (2-1 victory over Olivia Rozio) and another victory from its No. 3 doubles team Lauren Murphy and Jenna Cefaly, the Lancers (0-3) were unable to take down Newington. St. Paul 166, Wolcott 205: Michael Dolce shot a 38 for the Falcons (2-0) to earn medalist honors, and teammates Ryne Salius (41), Jordan Rinaldi (41), Jeremy Rinaldi (46) and Chris Millerick (49) helped defeat Wolcott (0-2) in an NVL match. Posted in The Bristol Press, Bristol Central, Bristol Eastern, St. Paul on Thursday, 11 April 2019 21:32. Updated: Thursday, 11 April 2019 21:35.